Vienna was a city that I only really scratched the surface of. 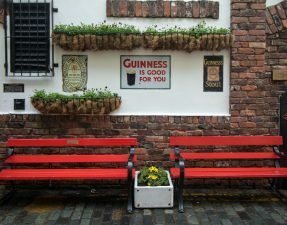 In fact, on a whirlwind trip through Bratislava and Vienna, I only managed to visit these 9 top attractions. One day I hope to return to Vienna so that I can really discover the city. I just want to see what all the big fuss is about, y’know? 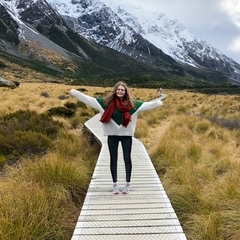 But if like me you only have 24 to 48 hours in Vienna and you just want to see all the best hotspots, here are 9 amazing places to visit in Vienna that you cannot go without seeing! First up is the beautiful Schönbrunn Palace, a UNESCO World Heritage Site. Schönbrunn Palace was the main summer residence of the Habsburg rulers and has become one of the most important architectural, cultural, and historical monuments in all of Austria. Contrary to what this image might portray, Schönbrunn Palace is absolutely massive. In fact, it is the biggest palace complex in Vienna. Taken from just one side of the palace, this photo does not demonstrate the full grandeur of the place. But what this image does portray is how many nooks and crannies there are to discover here. In fact, the pristine gardens of Schönbrunn may have been one of my favourite parts! Whilst the palace is pretty freakin’ stunning from the outside, take a tour of the palace too to discover 18th-century interiors and learn more about the palace’s history. The views from the top of St. Stephen’s Cathedral are simply unparalleled. 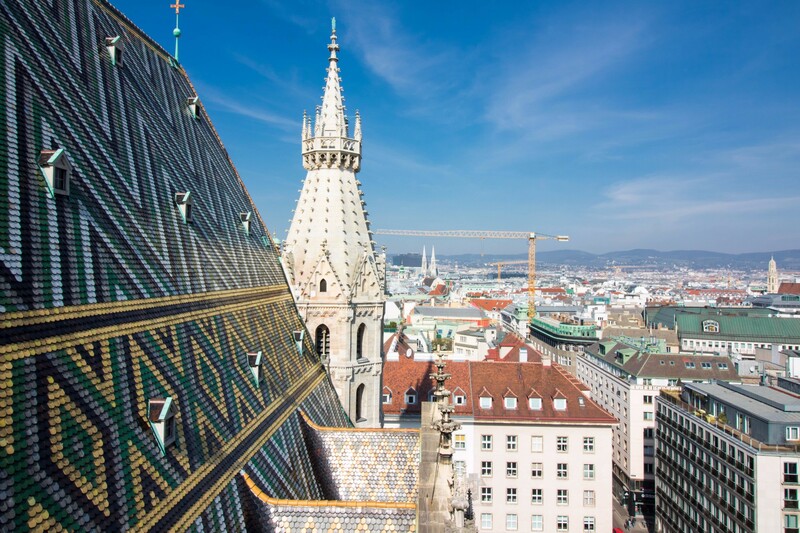 I love seeing cities from above so St. Stephen’s Cathedral was one of my favourite places to visit in Vienna. You can choose to go up either the North Tower or the South Tower, the former by lift and the latter by 343 steps. We went up the North Tower for the iconic view you can see above, plus a chance to see The Boomer Bell, the largest bell in Austria. It costs €6.00 to go up the North Tower and €5.00 to go up the South Tower. But the views more than justify the price tag! 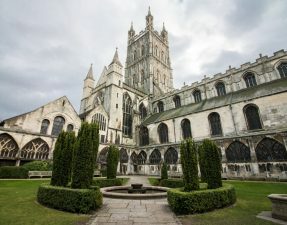 The cathedral is also an iconic landmark in and of itself. Constructed all the way back in 1137, St. Stephen’s Cathedral has such an interesting history. If you have time I’d recommend going on a tour of the cathedral and its catacombs below, leading you through the tombs of bishops and royals. Have you ever seen a cooler building? Well, if you have, hit me up, ’cause I need to check it out. Plastered all over Instagram (#guilty), Hundertwasser Village is definitely somewhere that looks even cooler in person than it does through your phone screen. Originally used as a car tyre factory, this building was transformed by Austrian-New Zealand artist Friedensreich Hundertwasser into what might be considered a colourful and quirky art piece. 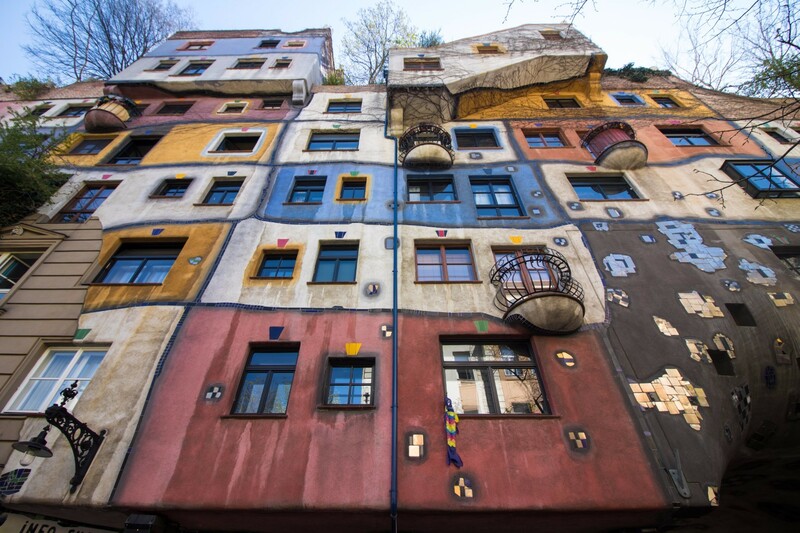 The building is now home to 52 apartments, 16 private terraces, shops, cafes and even a rooftop forest, so it is no surprise that Hundertwasser Village attracts tourists from all over the world! Particularly beautiful in spring, surrounded by beautiful magnolia blossom, Votive Church is certainly not a sight for sore eyes. 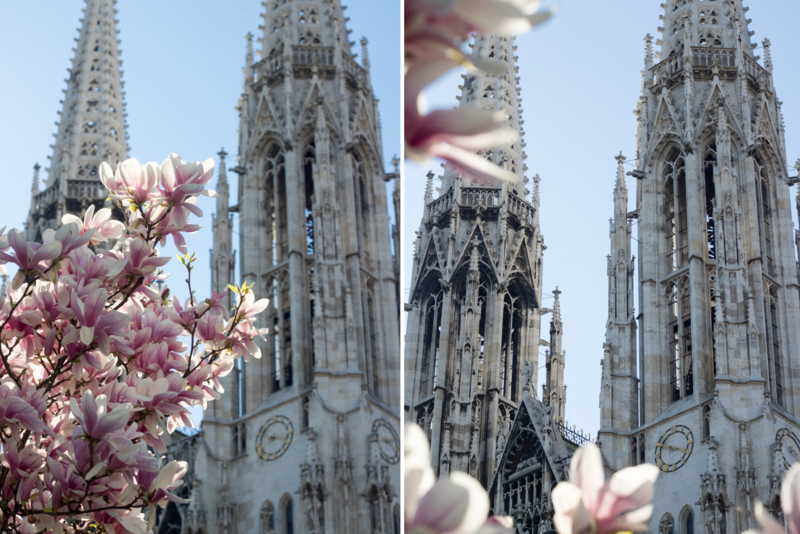 With its striking Neo-Gothic appearance, Votive Church is one of the most beautiful places to visit in Vienna. Following St. Stephen’s Cathedral, Votive Church is the second-tallest and probably the second most famous church in the city and it looks just as beautiful inside as it does from the outside. Just take a peek inside and see for yourself! Beautiful Belvedere Museum is yet another example of Vienna’s stunning architecture. Seriously, if you are a sucker for history and architecture, you know where to head. 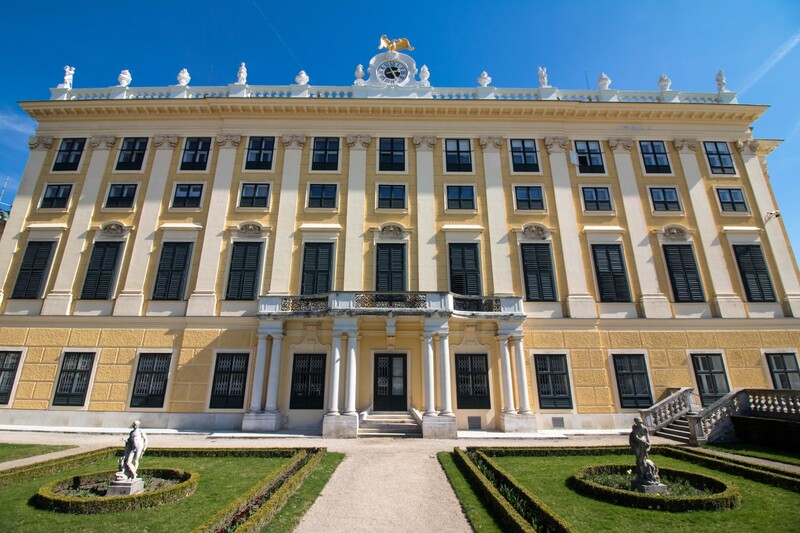 Built in the early eighteenth century by the famous Baroque architect Johann Lucas von Hildebrandt, the two Belvedere palaces were originally used as the summer residence of Prince Eugene of Savoy. 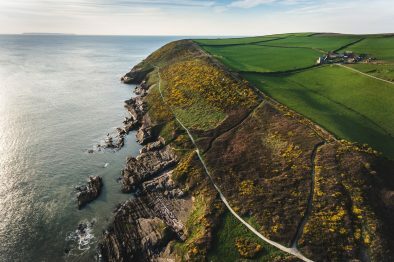 This famous landmark is now a listed UNESCO World Heritage Site. Visitors from all over the world come to marvel at both the palaces’ interiors and the colourful gardens outside. Not only that, but the museum also plays host to a number of exhibitions all year round. The culture vultures amongst you will absolutely love them. If you know me personally you will know that there is not much I love more on this planet than theme parks. If I could go on a rollercoaster every day for the rest of my life I probably would. So when I discovered that Vienna is home to Wurstelprater, the oldest amusement park in the world, I could not have been more excited. 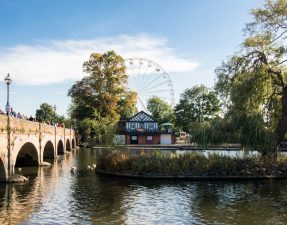 The park is more commonly known as Prater Park, the large public park in Vienna, where you can find Wurstelprater. In contrast to most other theme parks, access to Prater Park is free of charge. 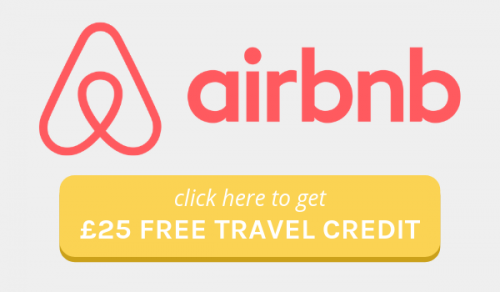 Only the attractions themselves are charged, with fees for individual attractions ranging from €1.50 to €5.00. The amusement park may not be home to the biggest rides but nonetheless, the few hours we spent here were a heck of a lot of fun. Prater Park’s most famous attraction is the Giant Ferris Wheel. 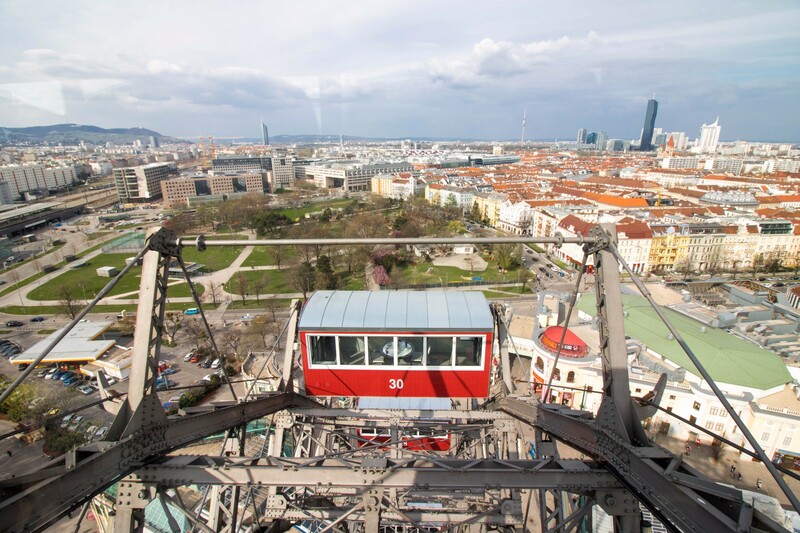 Standing at almost 65 meters tall, it offers breathtaking views across Vienna that are certainly not to be missed. Nestled in Vienna’s seventh district, you will find MuseumsQuartier, one of the largest art and culture complexes worldwide. 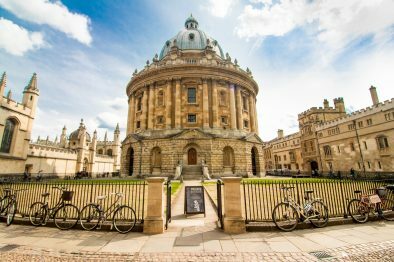 Not only does the architecture here continue to be bloody gorgeous but there is just so much to see and do here – and for free too! 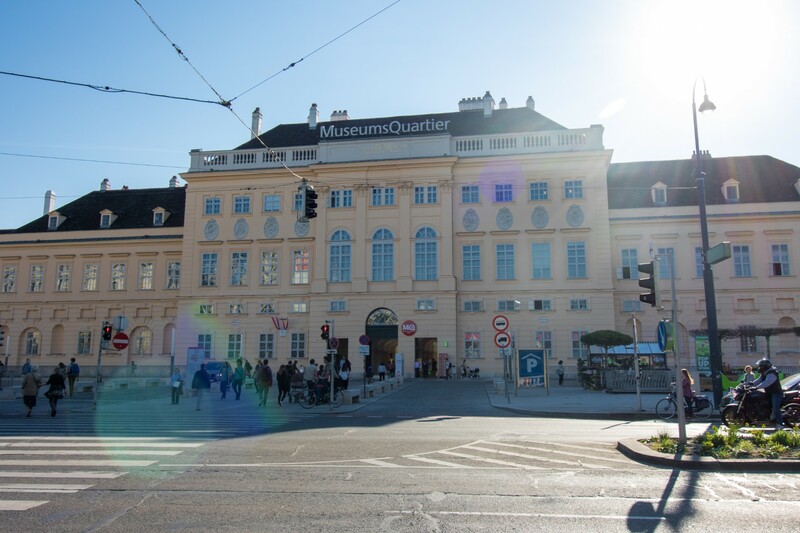 From the world-famous Leopold Museum to Architekturzentrum Wien, the Austrian Museum of architecture, you could easily spend a whole weekend here just immersing yourself in the various museums. Jess, my travel companion, and I actually stayed in MuseumsQuartier at 25hours Hotel, the quirkiest hotel in the whole of Vienna! This was a great base because we were really spoilt for choice when it came to museums, theatres, cafes and shops. 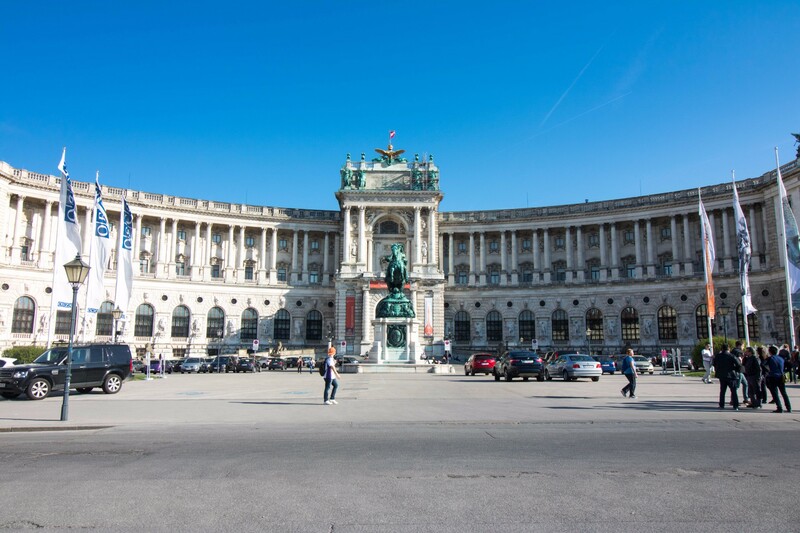 No trip to Vienna would be complete without visiting the famous Hofburg Palace. Dating back to the 13th century, Hofburg Palace is one of the biggest palace complexes in the world. As the residence and seat of government of the Habsburg emperors until 1918, and thus the centre of the Holy Roman Empire, Hofburg is brimming with history. 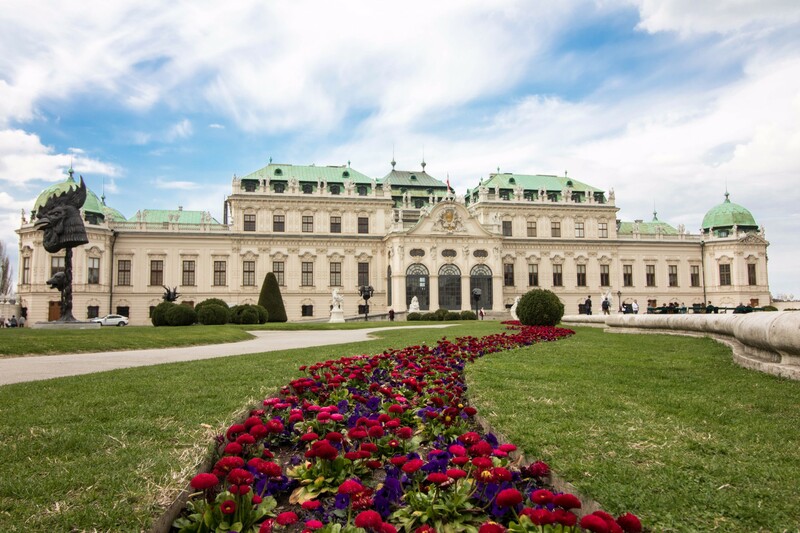 Today, Hofburg is home to numerous museums including the Sisi Museum which provides a deeper insight into the life of Empress Elisabeth of Austria. And the public can also explore the beautifully decorative Imperial Apartments too! Nearby to Hundertwasser Village, you will find the staggeringly beautiful Stadtpark. After a whistle-stop tour of Vienna, your feet will probably be aching like hell. And what better place to settle down for some much-needed R&R than Stadtpark? I mean, you’d be forgiven for thinking Stadtpark wasn’t in the middle of one of Europe’s largest cities. It’s just so blummin’ beautiful! So grab a picnic and relax amongst the beautiful greenery, taking in the flowers, trees, ponds, streams and local wildlife. 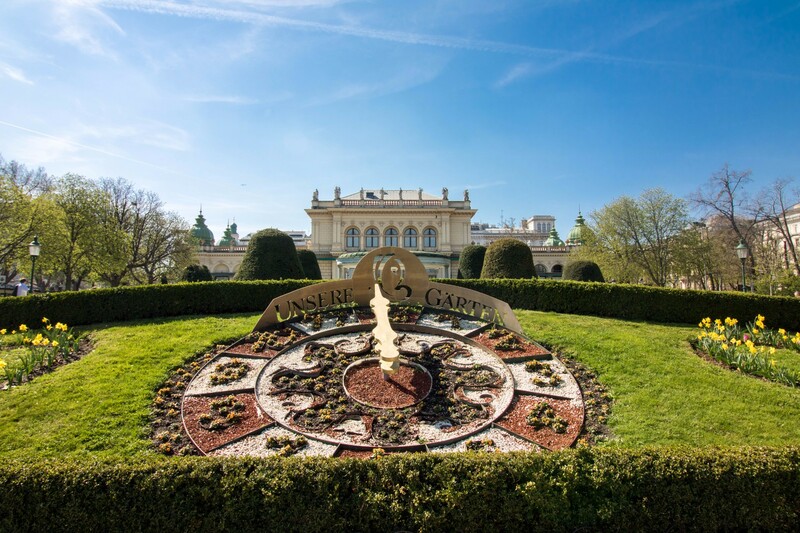 Have you ever visited the Austrian capital? What were your favourite places to visit in Vienna? Please let me know in the comments below!